Tailored to fit your child with adjustable desk height and tilting desk surface. Three desktop styles. What type is best for me? We recommend the Left Up for right handed children and the Right Up for left handed children. The Front Up is perfect for everyone. Uniquely designed with Moll brand German engineering, this ergonomic desk adjusts to fit your child at every growth spurt. The desk height and desk surface adjust fully to ensure healthy posture and encourage good study habits. A fun yo-yo style pulley makes it easy for your child to adjust the desk to the best height. This individualized ergonomic comfort reduces strain on your child's back and neck. The unique adjustable desk design ensures the same ergonomic benefits for your child from preschool through high school. 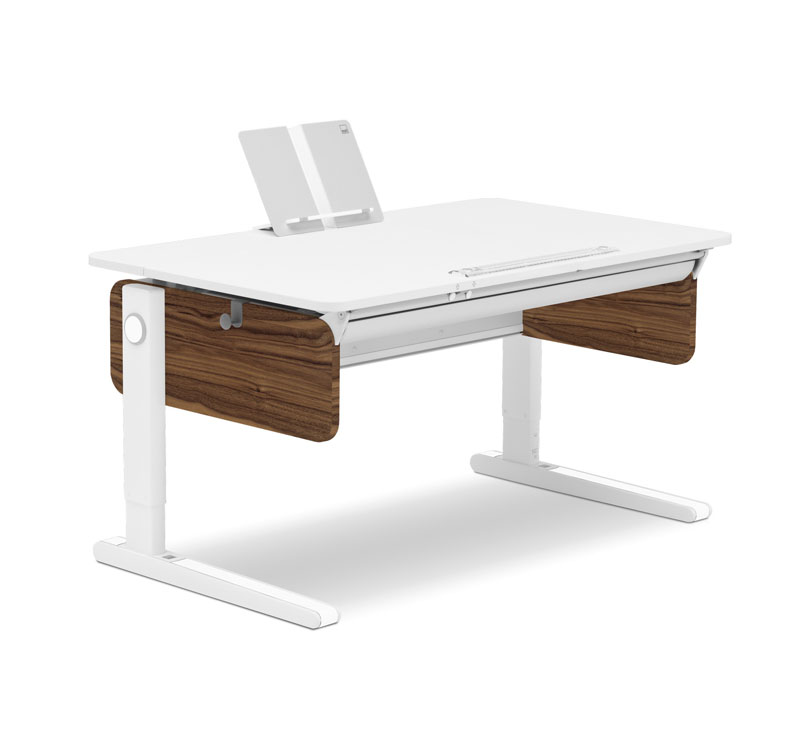 Moll Champion Desk is available in three desk surface styles: left up split top, right up split top and front up. All three desk surface styles are 47 1/4 inches x 28 5/16 inches. 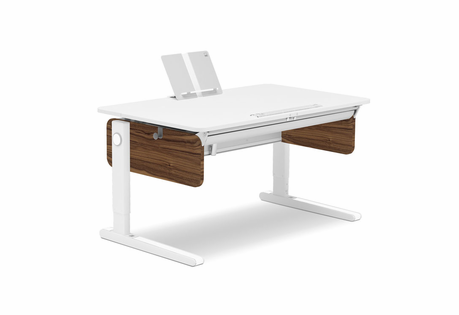 The adjustable desk surface tilts up to 20 degrees. A pinch-free, child-friendly button makes it easy for your child to position the work surface at the perfect angle for reading, writing and creating. A magnetic anti-slip strip secures items on the tilting surface. Left Up Split Top: A tilting work surface on the left and a stationary surface on the right and back of desk. Ideal for right handed children. Right Up Split Top: A tilting work surface on the right and a stationary surface on the left and back of desk. Ideal for left handed children. Front Up: The entire work surface tilts. A stationary surface on the back of the desk offers storage. Dress up your desk to match your favorite hue, decor or mood with assorted color covers for the leg runners and yo-yo pulley. Your child can easily change the colors anytime. 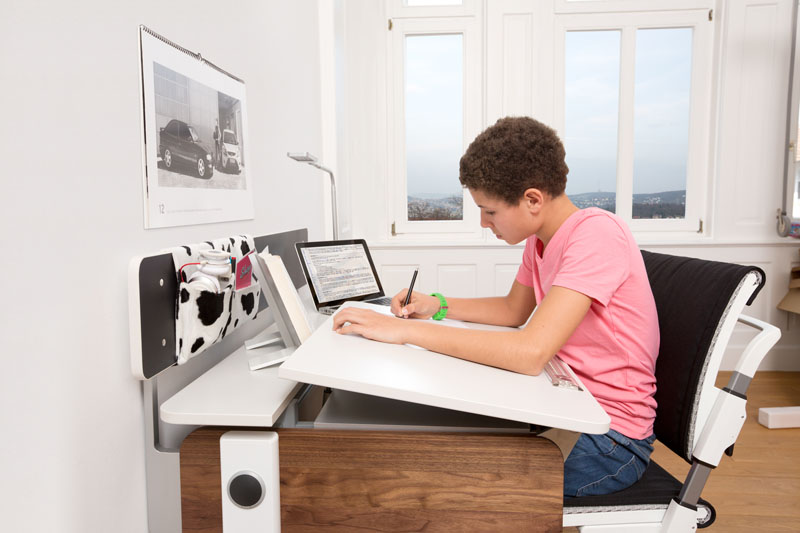 This versatility ensures the desk will fit your child's style from tot to teen. Includes leg runner covers and yo-yo pulley covers in eight colors: blue, red, orange, green, pink, black, white and silver. Desk leg bases feature disappearing rolling casters to easily move the desk. Magnetic anti-slip strip with a built in ruler and magnifying glass keeps books in place on the tilted surface. Roomy compartment on the back of the desk neatly stores power cords and cables. Super sturdy, kid-friendly construction. Made for wear and tear with easy-to-clean, exclusive melamine resin-coated chipboard. Portable book holder attaches to the desk or folds away in a book bag for ergonomic reading comfort wherever your child goes. Great quality and easy to install, this desk has been a life saver for our 9 year old. She loves to write and draw, but used to get neck pains when she worked on traditional desks. We looked at architect desks, but none of it had the design, quality, and functionality that Moll offered. The company, sales staff, and customer service are all great to work with as well - very responsive to questions. We also have the Moll chair and the Flexlight LED Lamp Desk. Couldn't be happier!